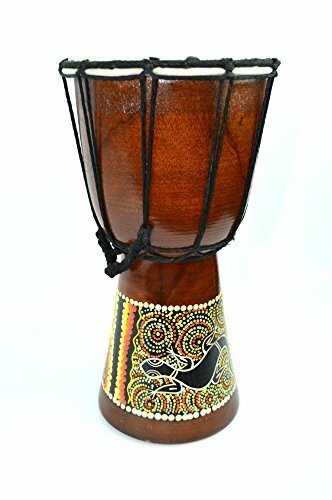 The Djembe is a skin covered drum which resembles the shape of a giant goblet and is made to be played best with bare hands and a lot of force behind it. Most Djembe Drums are traditionally carved, and each has their meanings and even stories behind them if you were to translate them. The traditional way in Africa to play a Djembe Drum is actually by standing, but in a lot of photos, you will see someone sitting while playing it. This may be a cultural thing as the Djembe Drum has gained a lot of widespread popularity in other areas of the world. In the oldest known method, however, shoulder straps are worn to support a player's shoulders and the lower portion of the drum is situated between the legs of the Djembe player as they beat out their tribal tunes. Sometimes a strap will even be implemented around the waist if a player needs further support and both hands are always used to play. This creates the greater diversity of sound capable by a Djembe Drum player. The wide range of tones that a Djembe Drum can make has to do with its size and shape, and an experienced player can make dozens of unique tones all with one single Djembe Drum. It is usually known however for its deep bass note. Djembe Drums are hugely popular all over Africa and spread among the native tribes there far and wide hundreds of years ago. It is called a secular Mande drum and is the most common man made the instrument in its homeland of West Africa or Mali. The Djembe Drum was originally called a Jembe drum; the D is there because French made their way to Africa and made French African colonies many decades ago. In Mali, the traditional tribal languages weren't written down, and it is thought that because of this combination the French sound is used. It is not entirely known why the French way of spelling Djembe has become the most widely used way to spell it when it is still pronounced by many other cultures with a J as it was called. Many school groups are realizing that the Djembe drum is a great instrument for school students to learn in class, instead of the recorder or guitar. The young people love the rhythms and beats, and can quickly pick up the various tones and styles. Working together, improving self-esteem and co-operation, even reducing stress, the popularity of the Djembe drum is growing, so watch out the world, the Djembe is coming!